We are living large in America. The Centers for Disease Control reports that more than one-third of US adults are obese. We all know it takes regular physical activity and a healthy diet to tackle this weighty nemesis. Physical activity is easy. It can be anything from walking, biking, swimming or even Prancercise if you’re so inclined. Eating healthy may be a bit trickier, and in some cases just downright ugh-inducing. Basically, we should aim for a rainbow on our plates. What that means is the more colorful fruits and veggies we have on our plate, the better. But what if you could drink your rainbow? Or what if you could eat your rainbow…from a bowl…with a spoon? Well, that would definitely bring a splash of fun to the fight. Baylor grads Denitia Blount and Tierra Barber firmly believe that your rainbow can indeed be fun, tasty and nutritious. 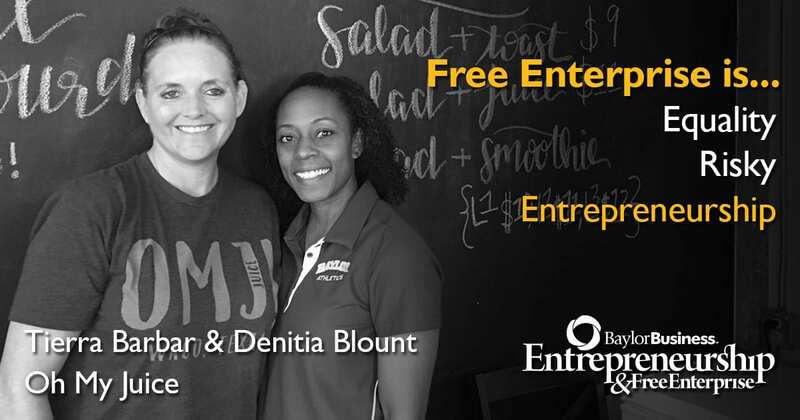 And anyone who has had an acai bowl or a cold-pressed juice from Denitia and Tierra’s Oh My Juice (OMJ) knows that this dynamic duo means business. Colorful, healthy and deliciously-fun business. OMJ is a #WACOTOWN eatery that offers juices, smoothies, acai bowls and other healthy treats. All menu items are made to order with fresh ingredients with no added sugars or preservatives. Nothing is prepackaged or processed. The end result is the ultimate rainbow of healthy goodness. But the tale of Denitia and Tierra is one of two very distinctly different journeys that came together at one very gloriously yummy final destination. While Denitia and Tierra both ran track for Baylor, their paths never actually crossed on campus. Denitia majored in education and graduated in 1988, while Tierra majored in health science studies and wrapped up her MSEd in exercise physiology in 2004. These two Baylor grads actually met in Arizona at the 2014 Fiesta Bowl where Baylor took on UCF. The outcome of the game itself was ultimately not-so-great for Baylor football fans, but for Wacoans who love a yummy healthy-food alternative…the game was definitely something to celebrate. When Denitia and Tierra met they realized there was a shared passion for maintaining a healthy lifestyle. As former athletes, they certainly have the know-how for physical activity. But there was also a mutual zeal for healthy eating, specifically juicing. It was then and there that these two decided they were going to bring Waco its first juice bar. The juicing duo first introduced Waco to OMJ by selling cold-pressed juices from a vendor booth at the popular Waco Downtown Farmers Market (the Market). The Market is open from 9:00 am – 1:00 pm every Saturday morning and features locally-grown produce, cooking demos, live music and awesome artisan vendors. The Market is the place to be on a Saturday morning in Waco. If you think about it, launching OMJ at the Market was an act of pure brilliance. Absolute, unadulterated, magnificent brilliance. What better place to launch a product line made up of local, fresh ingredients than a local, hot-spot farmers market? A perfect storm is a rare phenomenon where a collection of circumstances come together in a way the result is of such magnitude it’s beyond description. Let this sink in for a minute. You have two passionate Baylor grads with entrepreneurial hearts…a desire to be healthy and to help others be healthy…a yummy product line…a high-profile retail location that promotes local, home-grown produce… Pretty close to the perfect storm, but in a marvelous, non-weather kind of way. For the next year and a half, the juicing aficionados provided Market goers with a product that was not only unique to Waco, but it was also fresh, healthy and indisputably delicious. As this small, cold-pressed juice operation set up at the Market to gauge public interest, it didn’t take long for OMJ to become a popular Market stop. An all-natural, Saturday morning juice fix became a must-have for many Market goers. But soon once a week just wasn’t enough and eventually those who partook in the deliciously juiced delicacies were wanting more. And they wanted it every day. 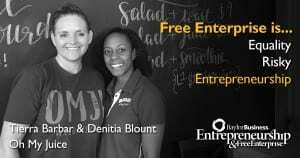 So, when Denitia and Tierra had the chance to move into a downtown, store-front location they jumped at the opportunity. The new brick and mortar location kept the duo in the heart of downtown Waco in the popular River Square Center. This was a game changer though. When customers only had access to OMJ once a week at the Market, they could be a bit more forgiving. Now that OMJ had somewhat of a cult following with everyday access, the pressure was on. The cool thing is these two juicing dynamos didn’t falter. Not even a bit. They successfully navigated the array of industry, state and local regulations for juice bars. And what started out in a Market vendor booth with two passionate entrepreneurs is now a store front with a staff of twelve. All the while, they continued to put out consistently delicious smoothies, salads ‘n such’ to the delight of their customers. The acai bowls have hands-down been the most popular item at the store front. Especially, the Berry Blend (acai, berries and apple juice) and the Nutty Coco Bowl (acai, almond milk, cacao and banana). They’re oh-my-goodness delicious! Regular Market goers needn’t worry though. OMJ is still at the Market on Saturday mornings providing fan-faves like Fruit of the Spirit (pineapple, apple, kiwi, orange, lemon and lime) and Hulke (apple, cucumber, celery, parsley, lime, spinach, lemon and ginger). Without a doubt, OMJ is adding a sparkle and energy to downtown Waco…one colorful, amazing juice at a time.